Despite the proximity of the sinonasal tumor to the central nervous system (CNS), distant metastases and involvement of the spine or the cerebrospinal fluid (CSF) are infrequently reported. Isolated leptomeningeal recurrence in particular is virtually nonexistent. In patients with localized disease at diagnosis, only 1 case each of spinal involvement5 and leptomeningeal carcinomatosis6 as isolated delayed recurrences of SNUC have been reported. In a retrospective study of 23 patients treated for SNUC with radiation therapy (RT) with a median follow-up of 5 years, 5 patients ultimately developed distant metastases simultaneously with leptomeningeal recurrence.7 The general incidence of leptomeningeal metastasis in cancers is rising and is thought to be due to (1) prolonged survival from improved supportive care and systemic therapy, (2) poor CNS penetration of targeted therapies, and (3) improved diagnostic imaging techniques.8,9 Here, we present a case of leptomeningeal disease as the isolated recurrence in a patient treated for a locally advanced SNUC, with implications for post-treatment monitoring and management of leptomeningeal recurrence. A 34-year-old African-American man presented to medical attention with progressive decreased sense of smell and bilateral vision deterioration for 2 to 3 months, and bifrontal headaches for 1 week. Imaging studies including computed tomography (CT) and magnetic resonance imaging (MRI) showed a mass involving the nasal cavity with extension through the skull base into the anterior cranial fossa. There was involvement of the orbits medially with compression on the optic nerves, left more than right (Figure 1). Radiologic stage was T4bN0M0. Intravenous steroids were started. The patient’s vision quickly declined further and he underwent emergent subtotal resection of the tumor using anterior craniofacial approach and decompression of the orbits and optic nerves. Dural disease was also removed. Pathology confirmed sinonasal undifferentiated carcinoma originating in the left nasal cavity and involving brain tissue, without lymphovascular or perineural invasion. Postoperatively, the patient’s left-sided vision improved and right-sided vision remained poor. Postoperative MRI of the head demonstrated residual tumor involving the lesser wing of the sphenoid bone bilaterally, the basisphenoid, left pterygopalatine fossa, nasopharynx and inferior turbinate. Two weeks after resection, the patient developed right visual loss due to optic nerve encasement and purulence within the epidural space, and a transnasal endoscopic drainage of an epidural abscess was performed. One month after the initial subtotal resection, the patient began adjuvant RT to the tumor, paranasal sinuses, and neck using simultaneous integrated boost intensity-modulated radiation therapy (IMRT) to a total dose of 7020 cGy in 39 fractions with 5 cycles of concurrent weekly cisplatin and paclitaxel. The patient’s course of treatment was complicated by weight loss and several CSF infections requiring neurosurgical intervention. After treatment, his right-sided vision improved. Follow-up MRI of the head did not show any residual or recurrent disease. He then received 3 cycles of adjuvant cisplatin/etoposide over the course of 2 months. One month after completing adjuvant chemotherapy, the patient developed a nasal encephalocele, bilateral maxillary sinusitis, and frontal lobe radiation necrosis resulting in herniation of the left frontal lobe into the nasal cavity, for which maxillary antrostomy, nasal endoscopy with resection of nasal encephalocele, and reconstruction of the anterior skull base were performed. The patient then missed several follow-up appointments and planned imaging studies. MRI of the brain performed over 1 year after RT demonstrated stable appearance to the sinonasal bed with no evidence of disease, but did show worsening necrosis in the frontal and temporal lobes. He was treated with hyperbaric oxygen for radionecrosis. Nine months after completing adjuvant chemotherapy, and 7 months following his final surgical reconstructive procedure, the patient began to develop lower back pain. The patient eventually developed significant difficulty walking, lower extremity neuropathic pain and numbness, constipation, and urinary retention. In the emergency department, he was nonambulatory and was diagnosed with cauda equina syndrome. MRI of the thoracic and lumbar spine demonstrated diffuse metastases in the spinal fluid of the thoracic, lumbar, and sacral regions, with particularly bulky involvement of the lumbar and sacral spinal canal (Figure 2). MRI of the cervical spine could not be completed due to patient intolerance. 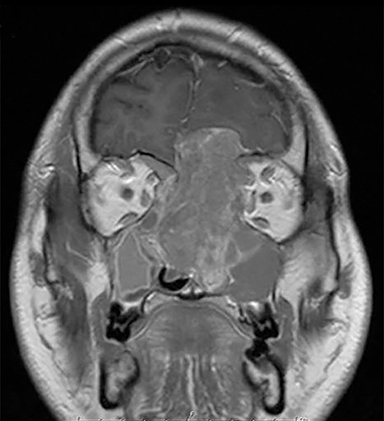 MRI of the brain demonstrated parenchymal volume loss and radiation necrosis, with decreasing cerebral edema. After considering treatment options and discussing his case in a multidisciplinary neuro-oncology tumor board, the patient began treatment with palliative RT in a staged manner. The patient first received treatments to the most symptomatic site, the lumbar and sacral canals, encompassing levels T12 to S4. Due to his poor performance status, he was treated to a dose of 2000 cGy in 5 fractions over 7 days. Treatment technique was 3-dimensional (3D) conformal with 6MV photons. After the second radiation fraction, the patient developed lethargy, tonic-clonic seizure and was found to have hydrocephalus. Levetiracetam was started and a surgical ventriculoperitoneal shunt was placed. The patient was then able to complete treatment. RT to T12-S4 appeared to relieve some pain for the patient, and he continued to improve until he developed 2 episodes of status epilepticus for which he was intubated. Continuous audiovisual electroencephalograms (EEGs) demonstrated subclinical seizure-like activity suggestive of underlying skull defect and diffuse cerebral dysfunction, which was consistent with his history of bifrontal radiation necrosis. For his seizures, the patient was treated with a higher dose of levetiracetam and lacosamide, later titrated to phenytoin. Other than an episode of laryngeal edema and spasm following extubation, the remainder of the patient’s hospital course was unremarkable. He completed palliative RT to the T5 to T11 thoracic spine (2000 cGy in 5 fractions) over 5 days. Upon completion of radiation, which improved his pain, he was discharged from the hospital on anti-epileptics and a prednisone taper. He had been an inpatient for 39 days. He could not ambulate independently and was discharged in a wheelchair. The patient was discharged to a rehabilitation facility for several weeks. He was able to stand and transfer from his wheelchair and could walk a few steps with a walker, but did not regain the ability to walk unassisted. One month after RT to the thoracic spine, the patient began to experience bilateral shoulder and neck pain, right finger numbness, worsening numbness and neuropathic pain in both feet extending up the calves, as well as persistent and intractable hiccups. MRI of the total spine showed marked leptomeningeal disease of the cervical spine, and progression of leptomeningeal disease in the thoracolumbar spine. The patient was referred to a radiation oncologist closer to his home so he could receive outpatient RT to the spinal levels C2 to T4 (1620 cGy in 9 fractions). Dose was reduced due to spinal cord dose delivered during prior head-and-neck RT. The patient succumbed to disease progression 3-and-a-half months after completing initial palliative spine treatment, and 1 week after completing RT to the cervical spine. SNUC is known to metastasize regionally to the cervical lymph nodes and distantly to the lung, bone, liver, and brain.12,13 However, metastasis and involvement of the leptomeningeal system are rarely reported. Leptomeningeal carcinomatosis is a late event in the progression of solid tumors. Treatment options for leptomeningeal disease include RT, intrathecal chemotherapy, and systemic chemotherapy. RT can achieve rapid symptom control and restore CSF flow in 30% to 50% of patients with CSF circulation obstruction.14 Our treatment strategy focused on palliative RT due to the diffuse and plaque-like nature of the leptomeningeal disease, which precludes adequate penetration of intrathecal and systemic chemotherapy. Despite the initial palliation achieved from RT, the patient developed recurrence in the previously treated spinal levels, which ultimately led to his death. Systemic therapy has a limited role in metastatic SNUC. Therefore, next-generation sequencing was performed on this patient’s tumor to identify an actionable genetic alteration that could be treated with biologically tailored therapy. We identified amplifications of ERBB2 and KRAS, and thus planned to use cetuximab following RT. Unfortunately, the patient’s poor functional status prevented him from receiving systemic therapy. Little data exists regarding the role of genomic findings on pathogenesis and metastasis of SNUC. Further research is required to identify the optimal systemic agents for SNUC. 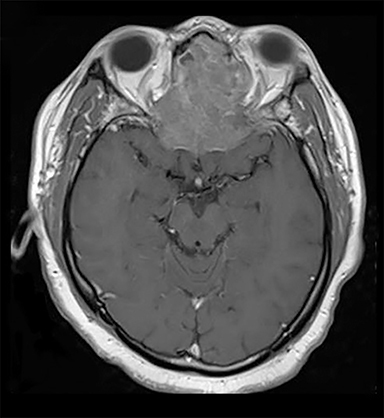 In conclusion, this case report presents a rare case of leptomeningeal carcinomatosis that developed as the only recurrence in a patient with SNUC where local control of the primary lesion was achieved with a combination of surgery, radiation, and chemotherapy. We hope to draw attention to the rare and highly lethal occurrence of leptomeningeal disease in SNUC. We suggest that patients diagnosed with SNUC undergo regular close surveillance for evidence of metastasis. It may be helpful to alert patients to the possibility of CNS involvement to prevent delay in seeking treatment once symptoms occur. Lastly, while a multimodality treatment approach is accepted as standard of care in treating primary SNUC, there remains a need to discover more effective treatments of advanced or metastatic disease. Gamez ME, Lal D, Halyard MY, et al. Outcomes and patterns of failure for sinonasal undifferentiated carcinoma (SNUC): the Mayo Clinic experience. Head Neck. 2017;39(9):1819-1824. Chambers KJ, Lehmann AE, Remenschneider A, et al. Incidence and survival patterns of sinonasal undifferentiated carcinoma in the United States. J Neurol Surg Part B Skull Base. 2015;76(2):94. Musy PY, Reibel JF, Levine PA. Sinonasal undifferentiated carcinoma: the search for a better outcome. The Laryngoscope. 2002;112(8):1450-1455. Ejaz A, Wening B. Sinonasal undifferentiated carcinoma. Adv Aantomic Pathol. 2005;12:134-143. Ghosh S, Weiss M, Streeter O, et al. Drop metastasis from sinonasal undifferentiated carcinoma: clinical implications. Spine. 2001;26(13):1486-1491. Liu SV, Wagle N, Zada G, Sun B, Go J, Rashtian A. Leptomeningeal carcinomatosis in sinonasal undifferentiated carcinoma. Head Neck. 2013;35(11). Christopherson K, Werning JW, Malyapa RS, Morris CG, Mendenhall WM. Radiotherapy for sinonasal undifferentiated carcinoma. Am J Otolaryngol. 2014;35(2):141-146. Drappatz J, Batchelor T. Leptomeningeal neoplasms. Curr Treat Options Neurol. 2007;283-293. Leal T, E Chang J, Mehta M, Ian Robins H. Leptomeningeal metastasis: challenges in diagnosis and treatment. Curr Cancer Ther Rev. 2011;7(4):319-327. Reiersen DA, Pahilan ME, Devaiah AK. Meta-analysis of treatment outcomes for sinonasal undifferentiated carcinoma. Otolaryngol Neck Surg. 2012;147(1):7-14. Al-Mamgani A, van Rooij P, Mehilal R, Tans L, Levendag PC. Combined-modality treatment improved outcome in sinonasal undifferentiated carcinoma: single-institutional experience of 21 patients and review of the literature. Eur Arch Otorhinolaryngol. 2013;270(1):293-299. Cerilli LA, Holst VA, Brandwein MS, Stoler MH, Mills SE. Sinonasal undifferentiated carcinoma: immunohistochemical profile and lack of EBV association. Am J Surg Pathol. 2001;25(2):156-163. Righi PD, Francis F, Aron BS, et al. Sinonasal undifferentiated carcinoma: a 10-year experience. Am J Otolaryngol. 1996;17(3):167-171. Mack F, Baumert BG, Schäfer N, et al. Therapy of leptomeningeal metastasis in solid tumors. Cancer Treat Rev. 2016;43:83-91. Meng Y, Brunckhorst K, Filippi CG, Langer DJ, Goenka A, Teckie S. Spinal leptomeningeal metastasis of sinonasal undifferentiated carcinoma. Appl Rad Oncol. 2018;7(3):44-47. Ms. Meng is a medical student at Zucker School of Medicine at Hofstra/Northwell, Hempstead, NY. Dr. Brunckhorst is an attending physician and fellowship program director, Department of Hematology/Oncology, Lenox Hill Hospital, Northwell Health, New York, NY. Dr. Filippi is the vice chairperson of diagnostic radiology, Department of Radiology, Lenox Hill Hospital, Northwell Health, and an associate professor at Zucker School of Medicine at Hofstra/Northwell. Dr. Langer is chairman of neurosurgery, Department of Neurosurgery, Lenox Hill Hospital, Northwell Health, and >professor at Zucker School of Medicine at Hofstra/Northwell.Dr. Goenka is the director of proton therapy and an attending physician, Department of Radiation Medicine, Northwell Health, Lake Success, and an assistant professor, Zucker School of Medicine at Hofstra/Northwell. Dr. Teckie is an attending physician, Department of Radiation Medicine, Lenox Hill Hospital, Northwell Health, and an assistant professor, Zucker School of Medicine at Hofstra/Northwell.